This post is sponsored by PhoneRescue. Data recovery solutions for smartphones aren’t anything new, as they all aim at recovering the data that you might’ve lost or accidentally deleted from your smartphone. In fact, there’s been a plethora of software that have been made available for both iOS and Android devices, over the last few years. Now, there are plenty of options that you can choose from, in order to serve the same purpose. However, we’ve got a pretty interesting solution that stands out from the rest of the competition, with its unique set of features. 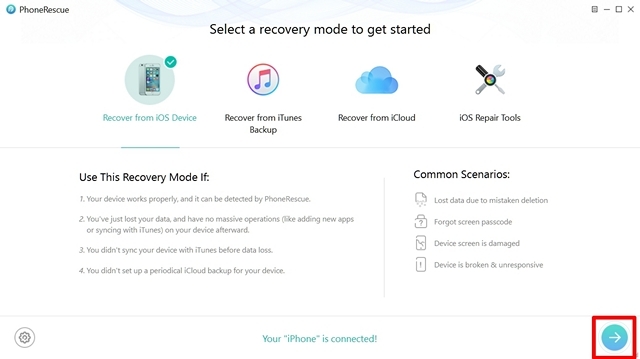 If you’re an iPhone user, then you’re in luck, because today, we’ll be taking a detailed look at PhoneRescue, an application for all your data recovery needs. So, before you get tempted to try out this nifty software all by yourself, let’s check out every single feature that PhoneRescue brings to the table. Unlike several similar data recovery software that’s currently available on the market, PhoneRescue easily manages to stand out with their own set of unique features, including some that the competitors are yet to catch up on. Well, without further ado, let’s proceed to the interesting part, shall we? If you’ve accidentally deleted some or all of the data from your iPhone, don’t start panicking. With PhoneRescue, you will now be able to recover up to 31 types of iOS data, which is a first for a software of its kind. 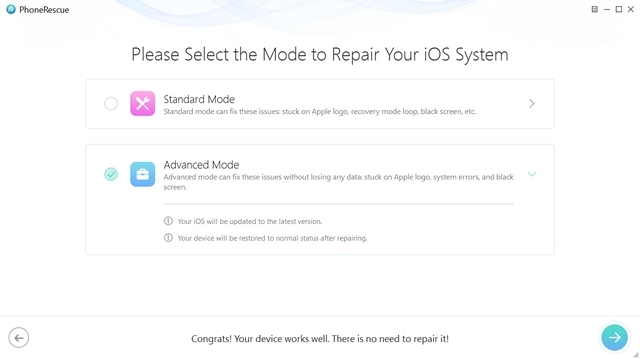 However, the procedure will not work if you’ve synced your device with iTunes or backed it up to iCloud after data loss. That being said, PhoneRescue manages to stand out from rest of the competition, by letting users filter the type of data that they’re looking to scan and recover from their iOS device. You can either choose to recover the files to your PC or directly restore it to your device, as if they were never lost before. There are two types of iOS users, based on the way they back up their data. Some of them makes use of Apple’s cloud storage service, iCloud to back up all the data on their iPhone, whereas the rest makes use of the old school method, i.e. iTunes to backup all the data to their computer. 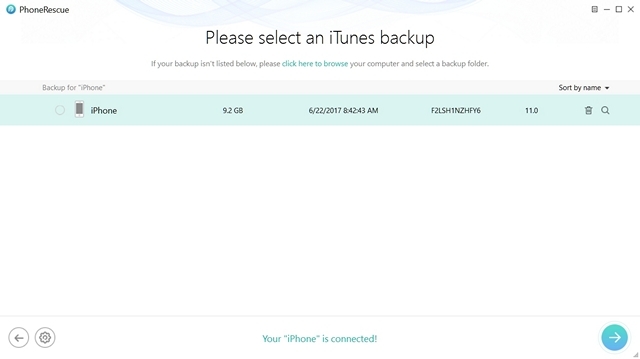 Well, with this software, it’s possible to recover your data from both iTunes and iCloud Backups. PhoneRescue manages to take this feature to the next level by letting its users restore data from encrypted, damaged and even inaccessible iTunes backups. With the latest version of PhoneRescue, you will now be able to fix some of the popular issues that iOS devices face, like software update failure, stuck on Apple logo, reboot loop, black screen and device stuck in recovery mode. Although this feature is not related to data recovery, its inclusion makes PhoneRescue a multi-purpose software. Also, this feature fixes the iOS issues and will never cause any data loss in your device, which means your iOS device and data in it will all be safe with PhoneRescue. PhoneRescue gives you the option of choosing the file format for the data it manages to recover, which is something that several other software misses out on. The software lets you choose between .csv, .html and .text file formats for the output data that’s recovered by the software. However, some file formats may be limited to a particular type of data. 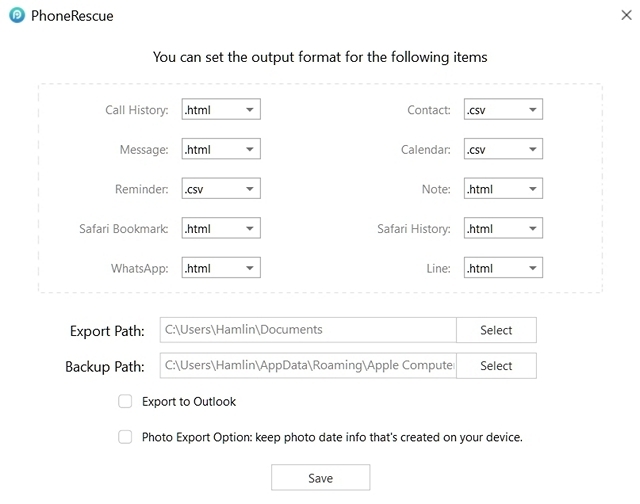 Open up the PhoneRescue software on your computer and connect your iOS device to the computer by means of a USB cable. Make sure iTunes is not running in the background while you’re using this software. Once you’re in the menu, choose “Recover from iOS Device” and then click on the arrow icon located at the bottom-right of this window. Now, wait for the software to finish analyzing your device. It will take a few minutes of your time. 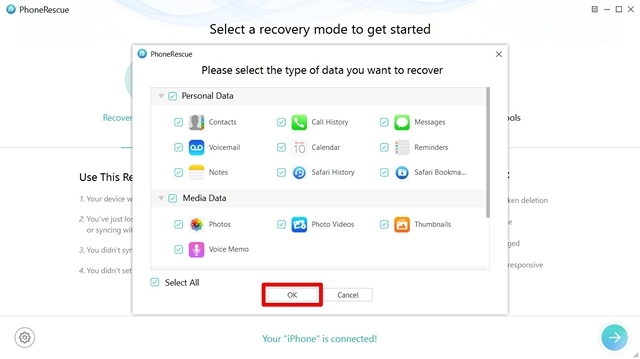 Once done, PhoneRescue will display all the data that you can recover from your iOS device. You can click on either the phone or computer icon located at the bottom-right of the window, depending on where you want the recovered files to go to. Well, that was quite an easy process, right? Thanks to PhoneRescue, we don’t have to panic once we lose our data again, as we can recover all of them within minutes. The ability to filter the data that you want to scan and recover that was made available in the latest version, is yet to be matched by most of the competition. 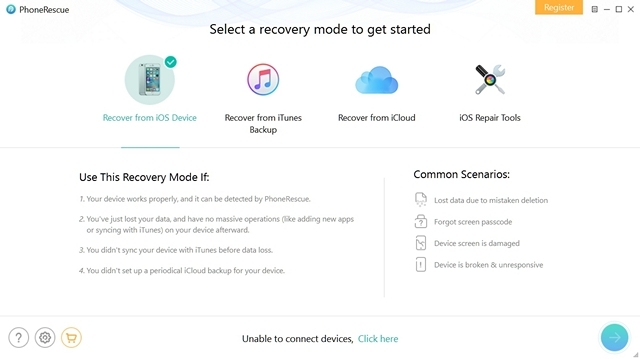 The procedure for recovery from iTunes and iCloud backups are pretty much the same, except for the fact that you have to choose one of the backups listed by the software, thereby letting the software to analyze and display all the recoverable data from that particular backup. Although PhoneRescue is jam packed with features, the clean user interface ensures that the options available in the software are not cluttered at all. The features are neatly divided into four sections, that can be easily accessed right from the home screen, so that, even someone with lack of much technical knowledge can access and use all the features without any hassle. However, my only gripe regarding the software is its stability, as it becomes unresponsive at times, to the point where i have to exit and restart the application. All in all, the software shines at how easy it is, to use, and doesn’t manage to confuse the end user. PhoneRescue’s iOS version can be downloaded for both Windows and macOS from the iMobie’s website. You can try the software for free, but you will only be able to preview all the data that you’ll be able to recover using this software. 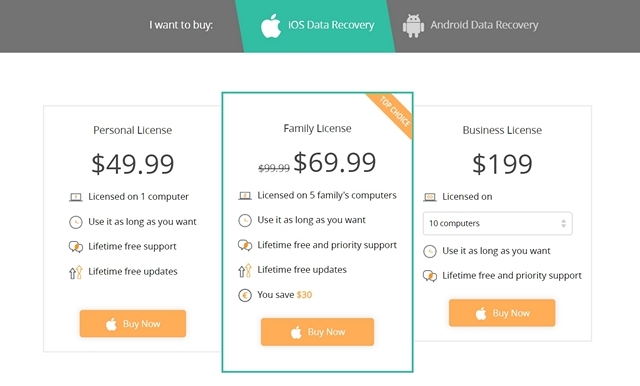 However, if you actually want to recover all the data, you will have to purchase one of the plans, which includes Personal, Family and Business licenses, costing $49.99, $69.99 and $199 respectively. All of the available options come with lifetime support and updates. Repair issues like reboot loop, black screen, software update failure and Apple logo freeze. Software instability, as it becomes unresponsive at times. After using this software for a while, I’m pretty confident regarding the fact that, when it comes to easily recovering all the data on your iOS devices, only a few can come close to what PhoneRescue brings to the table. From filtering the data type that you want to recover, to repairing iOS devices from black screens and freezes, the software clearly offers more than what it’s actually supposed to do. On that front, we’re completely satisfied with PhoneRescue, as we plan to use this software, whenever we run into some data loss or freezing issues. 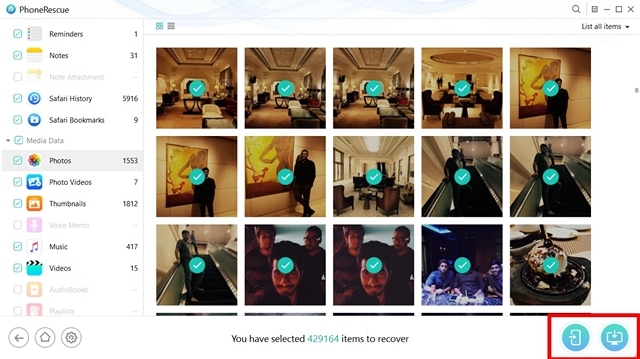 So, are you guys tempted to try out PhoneRescue for recovering your lost data? Make sure you let us know, by shooting your opinions in the comments section down below.